Kristian Campana has visited and documented more than 300 festivals on his blog OhioFestivals.net. When he isn’t writing about festivals, he is working jobs as an accountant and Italian translator, traveling with his wife and son or concocting some dish in the kitchen. Kristian resides in Oberlin. Unfortunately, a lot of people aren’t that familiar with the Moonshine Festival in New Straitsville, May 22-26, even though it’s one of Ohio’s rather unique fests. New Straitsville is about an hour southeast of Columbus. The festival in this old coal mining community celebrates how the residents survived after the mines were set on fire (they still burn today) and were no longer mineable…by making moonshine in the abandoned mines! At a time when alcohol was illegal to sell and consume (aka Prohibition), the people of New Straitsville made more than their fair share of “Straitsville Special” corn whiskey and shipped it out as far Chicago and beyond. The festival mainly channels this history through a working still that festival goers can watch as moonshine is produced. Since the festival is licensed to do this for educational purposes, the festival volunteers are required to dump the finished product, not allowing its sampling or purchasing. Of course, many patrons (and possibly volunteers) have complained about this in the past, but some things are changing in 2014. I say this because a new business called the Straitsville Special Distillery has recently opened up in town and they will have their own corn whiskey on hand to let you sample, purchase and invoke the spirits of long ago. It may be a turning point of the festival and a definite reason to check out the festival or revisit it! Beyond the moonshine (and novelty food items like moonshine burgers, dogs and pies), New Straitsville offers quite a bit in the sense of history and culture. 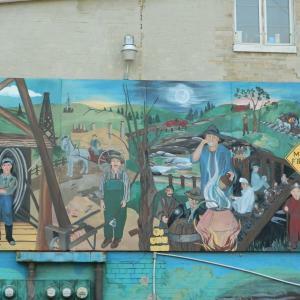 There’s a museum that’s free to visit with plenty of memorabilia, photographs and history regarding the town’s coal mining days, the strike, the fire and the eventual moonshine. There is also plenty of culture in the form of tractor pulls, Kiss memorabilia, and wrestling entertainment (the only festival I’ve ever seen this apart from the Arnold Sports Fest). For the festival goer who wants the standard fare, there’s that as well. Fair food, rides, an arcade and possibly the chance to win an ATV. What better vehicle could you win in the hills?